Data loss is one of those things you hope you never have to deal with. Macs are often perceived as well-built and extremely reliable. However the reality is that data loss can and does happen. It may be due to a failing hard drive, full hard drive or liquid spill. As we store more and more of valuable data on our computers, data recovery has become increasingly difficult with Apple’s introduction of flash storage hard drives to their laptop lineup. Let’s talk about the evolution of hard drives and why data recovery for Apple Mac laptops has become more challenging. As the MacBook and MacBook Pro become thinner and faster, so do their internal components. In order for Apple to make these newer Mac laptops impossibly thin, the hard drives now come in a slim, stick form of solid state drive that’s known as flash storage. The featured photo of this blog post shows the progression from a standard desktop-sized spinning hard drive (far left) to the newest Apple flash memory storage (far right). Traditional hard drives have a physical enclosure around a spinning silicone disk. Solid state hard drives also have an enclosure around solid state or flash memory. 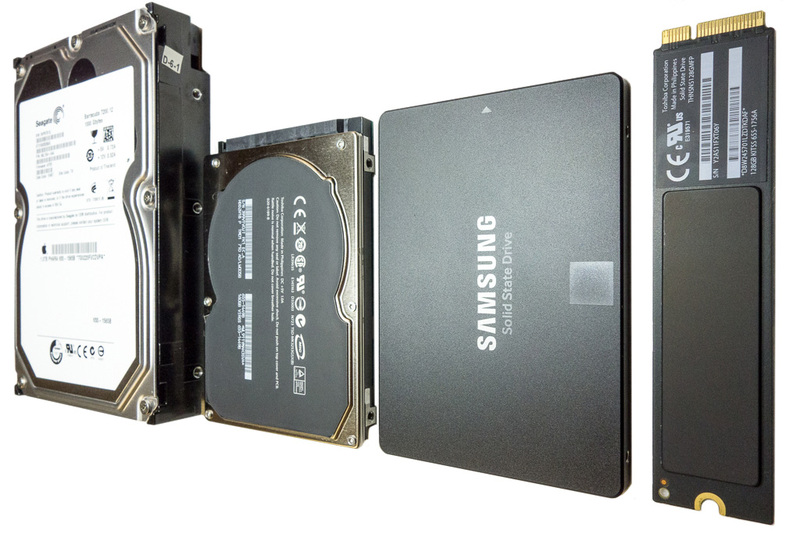 Standard solid state drives take the same size and shape as spinning laptop-sized drives. 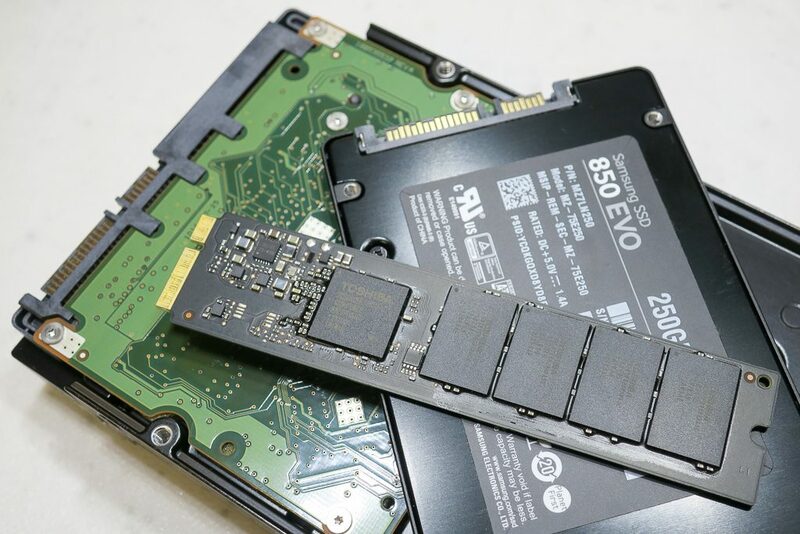 Without moving components SSD are much faster and more reliable. The flash memory storage in newer models of the MacBook, MacBook Pro and MacBook Air get rid of this enclosure altogether. It takes a much slimmer form that conserves valuable space inside the laptop. Here is a close-up of a traditional spinning hard drive next to a solid state drive and an Apple flash storage in most newer Mac laptops. As you can see, the the desktop-sized spinning drive is easily twice the thickness of the thickest MacBook Pro currently on sale. 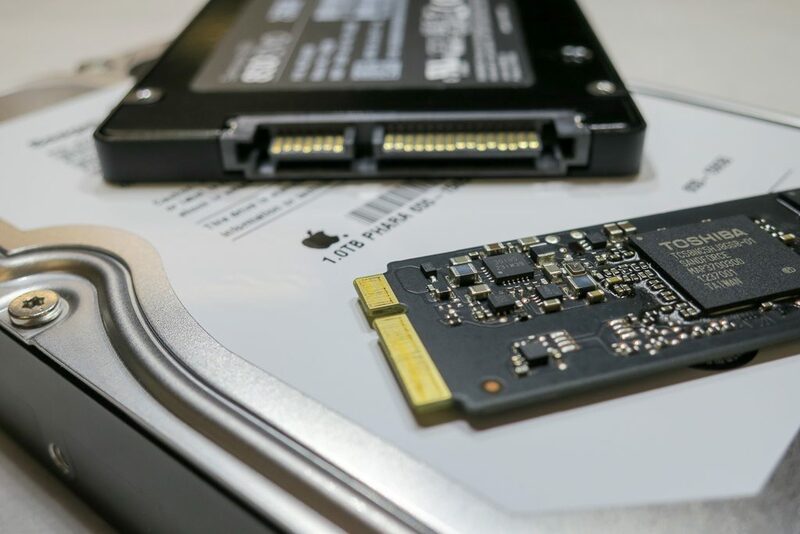 The standard laptop-sized SSD has almost the same thickness as the Apple MacBook 12″ retina. This flash memory storage is relatively new for the personal computer industry. That’s why it may not be something you’ve seen at computer retail stores. Because of its unique form factor, data retrieval requires a special, compatible tool. I’ve helped many customers with liquid spills retrieve data from this new but increasingly common storage device installed in 2013 and newer models of the MacBook Pro retina. Here are some best practices for Apple MacBook owners to prevent the heartache of data loss. Time Machine comes with every Mac. It automatically backs your Mac computer every hour onto an external hard drive. This is the single best thing you can do to minimize your chance of data loss. The Internet has made information so accessible that everyone can be a DIYer. There are certain scenarios when DIY may not be worth it. Data recovery is one of them. After a liquid spill, turning the computer on repeatedly to retrieve your data often further damages your laptop’s components. In the case of a failing hard drive, repeated attempts to retrieve your data further stresses the hard drive and may lead to complete failure. If your hard drive is full, you are overwriting files every time you use the computer. This can lead to corruption of the system booting files. Data retrieval and recovery is best left to the professionals because without the protective enclosures found in traditional drives, flash storage requires very careful handling and proper tools. If you’re in need of assistance retrieving data from a flash storage device, contact the IT Sage for an evaluation.